A look at farm real estate values relative to farm income and the value of production. Overall, pricier real estate values have been the trend. According to the USDA, the aggregate value of U.S. ag real estate is more than $2.5 trillion and represents 83% of total farm assets. For the last 25 years, U.S. farm real estate values have increased in a relatively steady manner, with some rather large increases occurring in the last decade. In recent years, agricultural incomes have fallen, and it is important to consider how the current values compare to the income generation of the sector. U.S. farm real estate values were collected from the balance sheet estimates made by the USDA’s Economic Research Service (ERS). Inflation adjusted (real 2017 USD) values for each year since 1960 are shown in Figure 1. The figure has a couple of notable features. First, the large increase and decline associated with the 15-year period from 1971-1986 are clearly seen in the figure. The second feature is the long upward trend starting in 1992. Since then, real estate has steadily increased, with only six years showing modest declines (the largest of those was a 2% decline notched in 2007). In contrast, three years saw double digit percentage increases. Since 1992 the appreciation in U.S. farm sector real estate has averaged a 4% real increase. This has taken farm real estate values roughly $500 billion above the inflation adjusted peak seen in 1981. Keep in mind all of the changes are real changes, having removed the impact of inflation which makes the performance all the more impressive. Figure 1. 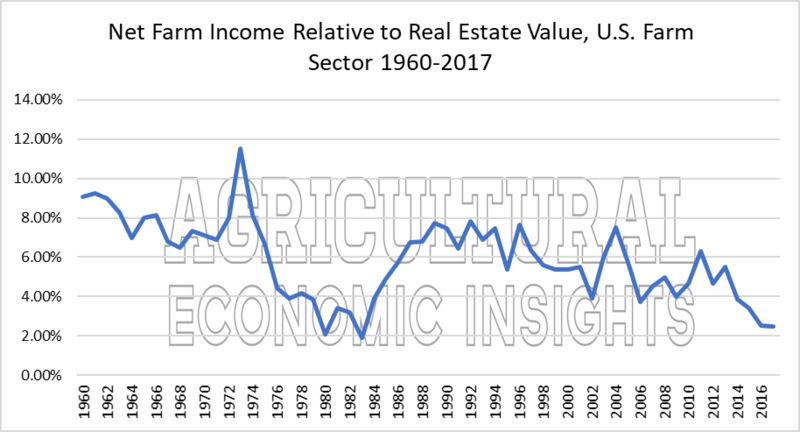 Real Value of All Farm Real Estate, U.S. Farm Sector, 1960-2017. How Do Values Compare to the Value of Farm Production? Farm real estate derives its value from the income that it can produce. The value of farm production consists of the value of crops and livestock produced by U.S. farmers. It is adjusted for changes in inventory values as well as other farm-related income. It might be thought of as a rough proxy for gross income. We chose this ratio over cash receipts because it makes adjustments for changes in the value of inventory. Figure 2 shows the ratio of the real value of farm production to real farm real estate values. Over the time period shown, this ratio averaged 25%. In other words, one dollar of farm real estate generated $0.25 of production. As the ratio declines, farm real estate generates less production relative to its cost. In other words, as the ratio falls real estate becomes more expensive relative to the value of production that it generates. Figure 2. Value of Farm Production Relative to Farm Real Estate, U.S. Farm Sector 1960-2017. The ratio has seen several periods when it was well over 25%. For instance, prior to 1975 and from 1985-1999 the value of farm production was at least 25% of farm real estate values. It has also spent considerable amounts of time below 25%. From 1975-1985 and since 1999 it has been below 25%. Today, the ratio stands at 16%. This is the lowest value that it has ever registered. At the sector level, a dollar of farm real estate has never produced a smaller value of farm production. In other words, farm real estate is valued quite high relative to the amount of farm production it is producing. This is a warning flag about the current level of farm real estate values. What About Real Estate Relative to Net Income? The value of farm production ignores the costs of production as well as the impact of government farm program payments. Figure 3 shows the ratio of net farm income to real estate values for the same period. This ratio has averaged 6% over the time frame shown. Although it appears more volatile than the previous measure, this is largely a function of the scale on the axis. The standard deviation of this series is 2% compared to 4% for the value of production to real estate values. The same basic pattern can be seen in this data as in the previous graph. While today’s value of 2.5% is not the lowest in the data (that occurred at 1.9% in 1983), it is among the lowest ever seen. In short, from a historical perspective sector level farm real estate values are high relative to sector level net farm income. Figure 3. Real Net Farm Income Relative to Farm Real Estate Values, U.S. Farm Sector 1960-2017. Of course, there are many different types of real estate and types of agricultural production within the farm sector. The analysis above combined all of these sub-industries and regions in an effort to provide a general picture of the U.S. farm sector. That picture suggests that, at the sector level, one should be cautious about the level of farm real estate values. The other alternative remedy is for farm income to start rising more rapidly than real estate values. The inflation adjusted value of farm real estate has risen steadily in the last two decades. At this point, the value of real estate on the farm sector balance sheet is historically high relative to both the value of production and net income produced in the sector. This does not mean that farm real estate is set to fall, incomes could increase, capitalization rates could stay low, or various combinations could occur. However, it does seem like such ratios indicate that a warning flag is flying at the sector level.